It is a great privilege for the Flomenhaft Gallery to host this exhibit and learn along with the public what excites artists that have been represented by our gallery as well as guest artists that we have asked to join us in this endeavor. Emma Amos chose JC Lenochan; Mira Lehr chose Judy Pfaff; Roberto Juarez chose Jack Pierson; Roger Shimomura chose Janet Davidson-Hues and Jacqueline Bishop; and Jaune Quick-to-See Smith chose Tom Nakashima. Mira Lehr has often been described as a visual poet. Others describe her vision as mystical. She uses nature-based images to explore the possibilities of painterly experiments. Subtle color harmonies combined with veils of Japanese paper that contrast with expressionistic splashes, drips, burnt edges created by gunpowder, and a fluidity of the grounds. Tensions balance between abstract and illusion, the hidden and the revealed, hard edged and soft focus all adding to the mystery and resonance of the work. Balancing intense planning with improvisational decision-making, Judy Pfaff creates sprawling sculptures and installations that weave landscape, architecture, and color into a tense yet organic whole. A pioneer of installation art since the 1970s, Pfaff synthesizes sculpture, painting, and architecture into dynamic environments, in which space expands and collapses, fluctuating between the two- and three-dimensional achieving lightness and explosive energy. Roberto Juarez was born in Chicago in 1952 to a Mexican father and a Puerto Rican mother. His move to San Francisco in 1973 to study at the San Francisco Art Institute was the beginning of his career. In 1979 he moved to New York and by December 1980, he had his first solo exhibition at the Robert Miller Gallery and was included in the New Wave New York exhibition at P.S. 1 in February 1981. In 1996 Juarez received a one-year fellowship at the American Academy in Rome. His artwork has been exhibited throughout the United States including Kemper Museum of Contemporary Art, Kansas City, MO, Museum of Contemporary Art, Florida; American Academy of Arts and Letters’ Invitational Exhibition of Painting and Sculpture, New York, NY; and Monterrey, Mexico. Juarez’s choice, Jack Pierson (born 1960 in Plymouth, Massachusetts) is a photographer and an artist. He studied at the Massachusetts College of Art in Boston. Pierson’s work includes photographs, collages, word sculptures, installations, drawings and artists’ books. His "Self-Portrait" series was shown in the 2004 Whitney Biennial and his works are collected by major museums worldwide. He has photographed many well-known celebrities and models, including Michael Bergin, Naomi Campbell, Snoop Dogg, Massimiliano Neri, Brad Pitt, and Antonio Sabato Jr.
Roger Shimomura has had over 100 solo exhibitions of his paintings and prints, and has presented his experimental theater pieces at such venues as the Franklin Furnace, New York City, Walker Art Center, Minneapolis, and The Smithsonian Institution. Among his many awards are four National Endowment for the Arts Fellowships in painting and performance art, a McKnight Fellowship, the Kansas Governor's Artist Award, a Civil Liberties Public Education Fund Fellowship, the Joan Mitchell Foundation Award, and he was the first artist internationally to be awarded a Japan Foundation Grant, as well as the first in the state to receive the Kansas Arts Commission Artist Fellowship in Painting. Shimomura is a third generation Japanese American, interned during World War II. His art, generally self portraits in a Pop art vein, act as a critique of the racist tendencies in American culture. According to Janet Davidson-Hues, “The words which I use in my work are structured as scripts of behavior, and confront irreverence, anonymity, contradiction, and misinterpretation. Articulated in a singular voice seeking to express the realities of existence as I see them, my work defines the female experience as a fusion between outward awareness and internal perception. In my latest work, I focus mostly on word and symbol, rhythm and pattern. I rely heavily on interpretative reading.” Jacqueline Bishop is known for paintings, drawings and installation that explore the psychological connections between humans and nonhumans. Influenced by two decades of traveling to forest fires in the Amazon, staying in her home during Katrina and documenting the devastation of the BP Oil Spill in the Gulf Coast she presents a poetic voice that addresses the politicizing of nature, species extinction and eco-political injustice. 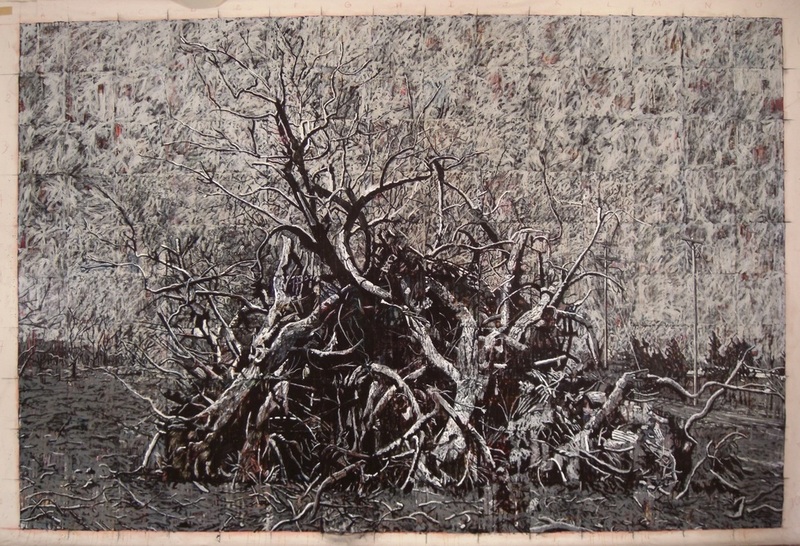 She has exhibited or lectured in Europe, Asia, and North and South America and is a grant recipient of the Pollock-Krasner Foundation and Joan Mitchell Foundation. Jaune Quick-to-See Smith is one of the most creative American Indian artists whose work explores Native American aesthetic traditions in a modern and post-modern art context. Over the years she has worked in many media, using an impressive vocabulary of techniques including painting, printmaking, pastels, and richly layered mixed media works. She embeds texts in a rich environment of images she creates and images she takes from a variety of sources. By doing this, she creates complex juxtapositions that recontextualize the way viewers understand not only relationships between Euro-American and indigenous American culture, but how she, as an artist of Flathead descent, views issues in both these cultures. Jaune’s choice, the great grandson of a samurai warrior and nephew of furniture legend, George Nakashima, Tom Nakashima, painter and printmaker combines color and texture to create spellbinding compositions open to myriad interpretations. Born to a Japanese-American father and an Irish-Canadian mother, Nakashima draws upon sources from both traditional Japanese art and modern European masters. As he grew up during World War II, members of his extended family were being held in internment camps – something that has become a major theme in the artist's allegorical work.